Or, click the + button. We've chosen Backup, which results in a new script named "untitled backup script." If you do the same thing again, you'll notice a second script underneath the first one, titled "untitled backup script 2". Depending on your Mac's screen settings, you might not see the script's full name. But you can fix that if necessary. First, hover the cursor over the vertical dividing line between the list of scripts and the rest of the window, or over the tiny vertical lines next to the word Scripts at the top of the script list. You'll know it's in the right place when it turns into a thick vertical line with two small arrows on either side. Then, drag it to the right until you can see all your scripts' full names. Now you have just one script called "untitled backup script." To change this name, highlight it where it appears at the top of the window and type in its new name. Or, double-click its name in the left column, then type in its new name. Once you hit the tab, enter, or return key, the two locations will reflect the new name. You set up synchronization and bootable backup scripts in exactly the same way as backup scripts, although with different default icons to help you differentiate them at a glance. Once you've created a script, you might want to make another one almost exactly like it, with just a few small changes. To do this, press the Control key, click the script that you wish to copy, then select Duplicate. A new script appears with the same name as the one you just duplicated, but with the word "copy" at the end. You can then change its name to whatever you like in the manner described above. So now you have one or more scripts set up and named: the next step is to determine which files will be copied, and where they'll go. The process is similar for backups, bootable backups, and synchronizations; however, there are enough differences among them that we'll look at each separately. You can synchronize from any folder or volume to any folder or volume. But unlike with a backup, you can't synchronize individual files, or synchronize from multiple sources. Regardless of whether you're making a backup, bootable backup, or synchronization, you define sources and destinations through the top section of Personal Backup's window. Clicking in the source or destination area of the window, finding an item you want to use, and clicking Select. Selecting menu options under the Script menu, Choose Source… or Choose Destination…. Using command keys: press Option-Command-S to select a source, and Option-Command-D to select a destination (as is shown in the above menu). 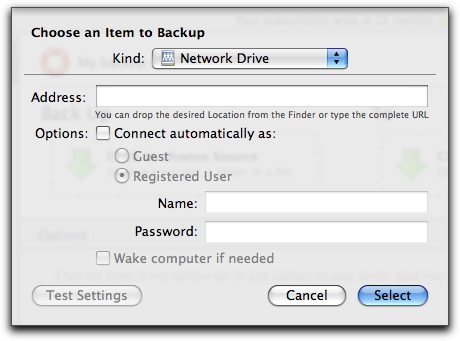 Using popup menus that appear the source and destination areas of Personal Backup's main window. These only appear when creating bootable backups. You can click Test Settings to check to make sure your settings are correct. 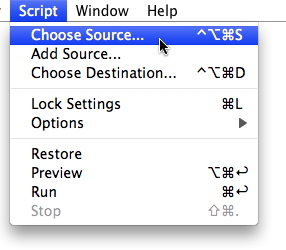 You can use a search from Spotlight, Mac OS X's search technology, as a source for your scripts. To do this, selectSpotlight Search from the Kind menu: you'll see a sheet where you can set up a Spotlight search. To create a search, first choose a location from the Search in menu. This can be Computer (your Mac), Home Folder(your home folder) or Other…. If you choose Other…, you can select any folder or volume you would like to search. Next, choose criteria for your search. For example, you could choose Content Modified from the first menu, then Afterfrom the second menu, and enter a date in the text field. Or you could choose a specific type of file (Other > Kind > Contains > Word to find all Microsoft Word documents). For more on using Spotlight to create searches, see Mac OS X's help documentation. Note that you can also drag a smart folder, which is a way of saving a Spotlight Search, from the Finder onto the Sourcesection of the Personal Backup window to add that search as a source. If the smart folder is in the Finder sidebar, click the folder, then drag its "proxy" icon - the icon in the title bar of the window - onto the Source section of the Personal Backup window. If your Mac has more than one optical drive, select it from the Preferred drive menu. If you want Personal Backup to verify the disc after running your backup script, leave the Verify disc after backup option checked. It's a good idea to do this; it only takes a few minutes, and ensures that your disc is readable. If you uncheck this option, you'll save time, but you may not have a working backup. You can only choose between Copy only changed files or Copy everything each time you run your backup. If you copy everything each time you run the backup, each backup disc (or set of discs) will contain all your files. If you need to restore any files, you can do so from any of your backup discs (or sets of discs). If you choose to copy only changed files, you can make incremental backups, each new disc (or set of discs) containing only those files that have changed since the previous backup. In this case, Personal Backup will ask you to insert thelast disc of your previous backup before copying files to new discs. (For example, if your backup spanned three DVDs, you will need to insert the third of these discs into your Mac.) This is done so Personal Backup can read information regarding the files that have already been backed up, so the program will know which files to copy. 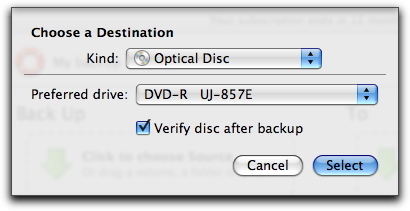 Note: Personal Backup can create multi-session backups on CDs, but not on DVDs; this is because the Mac OS X framework for writing optical discs cannot write multiple sessions on DVDs. This allows you to use empty space on CDs for incremental backups. If you back up to CDs, and have only used half the capacity of a CD, Personal Backup will be able to use the remaining space for your next backup. 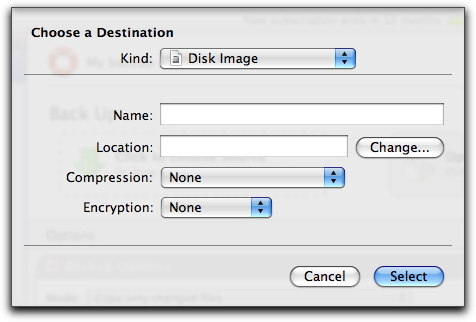 In this sheet, choose a name for your disk image, and select a location by clicking Change… or by dragging a folder or volume into the Location field. If you wish your disk image to be compressed, choose a form of compression, and if you want to encrypt your backup, choose from two levels of encryption. When you run the script the first time, Personal Backup creates the disk image. Each subsequent time, Personal Backup mounts the existing disk image if it is in the same location. If you move it, though, Personal Backup will create a new disk image with the same name, so you should make sure to leave the .dmg file in the appropriate location. Once you've chosen a source or destination, you can change it by clicking it and selecting an option from the large popup menu that appears. Options vary depending on whether you're working on a backup, bootable backup, or synchronization. A backup source can be pretty much anything. You can create a script that backs up a single file, a folder, a volume, or entire drive, or combinations of any of these, spread among multiple devices. Edit the current choice by clicking the pencil icon, then selecting a new choice. Remove the current choice by clicking the - icon. Add an additional source by choosing Add Source… and selecting the desired source. Same choices as synchronization source, except that Change Source… has become Change Destination…. So far, we've considered Personal Backup from the point of view of lone Mac users who don't need to share or protect their backup scripts. But if you share your computer, you might want to protect your scripts from the itchy fingers of others. And if you know others who also have Personal Backup, you might want to share copies of your scripts with them so they can see what you did. Personal Backup includes a very simple system that prevents accidental changes to your scripts. Since the scripts themselves aren't valuable information, the "lock" is more of a deterrent than a security measure: for example, no password is needed to unlock scripts. But it's an effective tool to prevent scripts' accidental deletion or changing. To unlock the script, either select Unlock Settings in the contextual menu, choose Script > Unlock Settings, or press Command-L again. To export a script, click it in the script list, then either choose File > Export Script… or press Command-Shift-S. To import a script that's been exported, whether from your copy of Personal Backup or someone else's, either chooseFile > Import Script…, press Command-O, or double-click the script's icon in the Finder. Exported scripts are plain-text XML files that store all the script's options, including the locations of sources and destinations. If you move the script to a Mac that doesn't have the source or destination in the same location, the script will open but not run. At this point you know how to set up Personal Backup scripts to create backups, bootable backups, and synchronizations; how to show which files should be backed up; how to protect those scripts; and how to transfer them among Macs where Personal Backup is installed. You can run any of these scripts by clicking the one you want in the left column and pressing the Play button in the lower-right corner (that is, the right-pointing triangle). But Personal Backup gives you much, much more control over operations than you've seen so far, through Script Options. Schedule. You can make a script run periodically, wake up your Mac (if it's asleep), or run even if you're not logged in. Schedules can have several parts, so for example you could direct Personal Backup to run a backup every Monday and Wednesday at 5pm, then again on the first of every month. Preparation. You can set Personal Backup to run another program before starting its script. Most commonly, the program will be Intego VirusBarrier X6, to identify dangerous files before copying them (and possibly infecting other files or computers). However, you can also direct Personal Backup to run any program, including a custom AppleScript that, in turn, runs several other programs. Exceptions. Personal Backup has selectors that give you wide-ranging control over which files are copied. You can choose to back up (or not back up) files based on their visibility, name, kind, path, size, date created, date modified, label, or any combination of these criteria. Options. Each of the three script types - backup, bootable backup, and synchronization - offers a set of choices specific to that script. These involve the number of backups to keep; whether to copy aliases or the files to which they point; what to do when a file has been changed on both the source and the destination disk; and so forth. Finishing. Like the Preparation option, Finishing lets you direct Personal Backup to run a program (or AppleScript) after the script is finished. It also lets you choose whether to unmount the destination disk, quit the program, run another Personal Backup script, put Mac OS X to sleep, or shut down your Mac entirely. You can view each of these five sets of options in any of three ways: by clicking its button, by choosing its menu item, or by pressing its command-key combination. Each set of options shows up in its own section of the Options part of Personal Backup's main window. But you don't need to specify any of these options: if you don't, the script will simply run using Personal Backup's default options. Select the same menu item that causes the option to appear. In any case, a dialog box will ask you to confirm your choice. You can run a Personal Backup script at any time by pressing the Play button in the main window's bottom-right corner. But much of the convenience of backup and synchronization operations is in setting them to run periodically, without your intervention or attention. For example, you might want a backup script to run automatically whenever you plug in an external hard drive, or synchronize two computers whenever they're on the same network together. Schedules make this possible. Click the Schedule button at the bottom of Personal Backup's main window. Every Day: Select the time of day. Every Week: Select the day of the week, and the time on that day. Every Month: Select the day of the month, and the time on that day. Every ____: Select the number of periods and the length of the period (minutes, hours, days, weeks, months). For example, you could make the script run every 20 minutes, or every three months. You can set up complex schedules by clicking the + button to add more lines to the Run script section. For example, here we've set a script to run every week on Monday and Friday at 11pm, then on the first day of every month at 1am. Wake up computer if necessary allows you to put your Mac in its power-saving "sleep" mode, yet still be confident that Personal Backup will perform its scheduled script. Once the script is completed, the computer will remain on, unless you also turn on an option in the Finishing section to put the computer back to sleep when done. (To learn how to do this, see Finishing: Postprocessing Files, below.) Note that this option will not turn on your computer if it's fully turned off, rather than merely asleep. Run this script even if you're not logged in allows the script to execute even if no-one, or another person, is logged on at the time it's set to run. Run script when volume ____ is ready automatically starts the script when the specified volume is visible to your Mac - for example, whenever you connect to a network, or turn on or plug in an external hard drive. Except for your Mac's startup drive, all volumes that are given as sources or destinations for this script are available in the popup menu; if both the sources and destination are on your Mac's startup drive, this option will not be available. Click the Preparation button at the bottom of Personal Backup's main window. This option lets you run a program before Personal Backup makes its copies. Because a virus checker is what Mac users most often want to run before backing up or synchronizing, the first checkbox is dedicated to Intego VirusBarrier. Personal Backup will work with either VirusBarrier X5 or VirusBarrier X6 to scan your files. The second checkbox lets you direct the script to run any application first. That program could be a Mac application with a graphical interface, an AppleScript, a shell script, an Automator workflow, or even a sound file that you want to play when the script begins. When you check this box, you'll see a dialogue box asking you to select the program to be run; to change it later, click the Choose… button. Click the Exceptions button at the bottom of Personal Backup's main window. The first two popup menus let you specify whether you want to copy - or not copy - items matching any of the conditions you give, or all of them. For example, changing this selection could make the difference between copying only files with "cache" in their names, none of them, or those files together with others. The next section lets you specify the type of information that you want the filter to find. The choices are: Visibility,Name, Kind, Path, Size, Created (i.e., the date the file was "born"), Last Modified, and Label. After choosing one of these, you'll have the opportunity to specify filter details. As in the Schedule section, clicking the + button at the right of the window adds an additional condition, while clicking the - button next to a condition removes it from the list. You can also modify filter conditions by simply changing their popup menu options or typing new data into the data fields. Click the Backup Options button at the bottom of Personal Backup's main window. Click the Bootable Backup Options button at the bottom of Personal Backup's main window. Click the Synchronization Options button at the bottom of Personal Backup's main window. We'll look at each of these individually. Mode: This section defines how many versions of copied files you wish to keep. (The Backup Decisions section of this manual will help you decide the best strategy for you.) By default, Personal Backup saves all old versions of your files until your backup disk is full, after which it deletes the oldest backups in order to have enough space for new ones. However, you can choose to save only a specific number of old versions. The other option in the Mode popup menu is Keep the latest version of each file only. Selecting that reveals three different options. Remove files deleted from source ensures that your backup doesn't contain copies of any files that you have removed from the source location. In this case, your backup precisely reflects the current contents of your source. Overwrite destination files, even if they are more recent than in source makes the backup truly one-way: it assumes the source contains the definitive versions of files that you want to keep, no matter what. This could be useful if (for example) you use files at the backup location for testing purposes while those at the source location are used for "real" business. Back up to root level of destination when only one source is defined produces a "mirror" of the source that could be less complicated than other backup schemes. The Permissions section asks whether you want Personal Backup to copy only those files that you have permission to read, or whether it should use administrator authority to copy all files. If you choose the latter, you're given the choice of either entering an administrator's password just before the script runs (Ask for authentication before running script) or ahead of time (Do not ask for authentication). To copy all files, you must enter a user name and password belonging to someone with administrator-level permissions. To determine who that is on your Mac, choose System Preferences… from the Apple menu, and open the Accounts preference pane by clicking its icon: users with such power will have "Admin" under their names. The Advanced options section contains a single checkbox, Resolve aliases. If you leave this unchecked, each alias file will be copied to the destination location without any changes; check it, and the file to which the alias points will be copied instead. Bootable backups have four options. Do not ask for an administrator password makes Personal Backup ask for the administrator password when you define the script, saving you from having to enter it later. If you leave it unchecked, you'll have to enter the password just before the script runs. Never remove anything in destination: if you leave this unchecked, Personal Backup will make a perfect clone of the source volume, erasing everything on the destination in the process. By checking it, you're saying that you want a perfect clone of the source to be created on the destination volume in addition to content that's already there. Note that checking this box could cause trouble with your bootable backup. If you simply want to keep a folder from being deleted, you can add it as an exception. Repair permissions on _______ examines the permissions on system files. Personal Backup will attempt to fix any errors it finds. Repair _______ examines the destination volume after running the bootable backup to make sure that it's in good shape. Personal Backup will attempt to fix problems it finds, such as directory errors. A synchronization coordinates the files contained in two folders or volumes so they both have the same versions of all files. The question arises when the same file has been changed on both the source and destination volumes: which one should be copied? The first popup in the synchronization options window lets you decide. The first option, Ask, displays a window whenever it encounters a file that's been changed in both places. On the left you see details about the document in its source location; on the right, the same document in its destination. In the bottom right of each section is a small magnifying glass icon: clicking it shows the file in Quick Look. You can show the file in the Finder by pressing the Option key when you click the magnifying glass. You have two options for this file: either make the version on the source location the "official" one that gets copied, or copy the version that was changed most recently, then click the Continue button. Or, you could choose to ignore all such conflicts by checking Resolve other conflicts then choosing one of the elements in the popup menu. If you want to resolve the conflicts later, click the Resolve All Later button. If you make no choice within 60 seconds, Personal Backup will act as though you clicked the Resolve All Later button. The popup menu labeled When files have changed on both sides since last sync also has selections to make Personal Backup act consistently whenever it runs into such synchronization conflicts. Besides Ask, its other four options are Copy from Source, Copy from Destination, Copy newest, and Copy oldest. Whatever you choose, Personal Backup will erase previous versions so that only one version will remain on both the source and destination volumes. However, you can override this behavior and save all previous versions by checking theNever delete anything checkbox. To copy all files, you must enter a user name and password belonging to someone with administrator-level permissions. To determine who that is on your Mac, choose System Preferences… from the Apple menu, and open theAccounts preference pane by clicking its icon: users with such power will have "Admin" under their names. Click the Finishing button at the bottom of Personal Backup's main window. The first Finishing option is similar to one you read about in the Preparation section: it lets you run another program once the script has finished. As before, this program can be any application, AppleScript, shell script, Automator workflow, or sound file that you want to play when the script completes. When you check this box, you'll see a dialogue box asking you to select the program to be run; to change it later, click the Choose… button. The next option, which is checked by default, directs Personal Backup to unmount the destination volume when the script is complete. Here a popup menu gives you two options: either unmount the volume only if it was mounted by Personal Backup (a network volume, for example), or always. The last option allows you to tell Personal Backup to quit, put your Mac to sleep, shut your Mac down, or run another script. 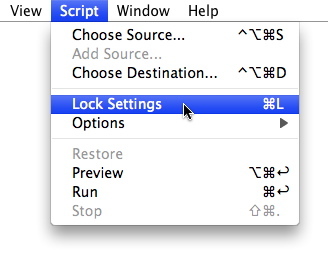 If you select Run script, you'll see another popup menu, listing all available scripts. In this way you could have Personal Backup perform a series of scripts, one after the other, and finally shut down. What Happens When You Click "Play"
At this point everything's set: you've chosen which files to copy, what Personal Backup will do with those files, how it will handle exceptions, and what it will do before and after the script is complete. Now it's time for action! To run a script, click it in the left column, then click the right-pointing triangle in the lower-right corner (called the Play button, as it resembles that button on a DVD player.) The label on this button will vary, depending on whether you're performing a backup, bootable backup, or synchronization. For the most part, Personal Backup will run without your intervention: once a script's scheduled time arrives, or you press the Play button, the program does exactly what you directed, every time. However, there is one notable exception: if you're making a backup to removable media such as DVDs, you may have to watch the process and insert new media as needed. Personal Backup provides ways to inspect a backup or synchronization before, during, and after it has run. The Previewbutton shows you exactly which files will be copied; you can see how the process is humming along in three different ways by clicking the Summary, Chart, and Details buttons; and the Log keeps a record of past scripts, both successful and failed. So now you've set up your backup or synchronization script. But what, exactly, will happen? How many files will be copied? In which direction? What if you want to make a temporary exception? With its Preview function, Personal Backup answers all these questions. Click your script in the script list, then click the Preview button at the bottom right of Personal Backup's main window. Alternately, you can enter Preview mode by choosing Script > Preview, or pressing Command-Option-Return. The left column shows the name of the file or folder to be copied; the center column shows what will happen to it; and the third column shows where the item will end up in the destination location. Note that even invisible files appear in this list, so you'll see some (such as .localized in the above example) that don't appear in the Finder. Want to see more information? Clicking View in the window lets you display two additional columns of information for each item in the list: its modification date, and creation date. A checkmark appears next to those that are showing: to hide them, simply select them from the View menu again. Here's the same window, with all information visible. Here it is, fully expanded so you can see each file's complete path. Double-clicking any portion of the file path reveals the file in the Finder. What if you see an item that you don't want copied? Of course you could create a rule in the Exceptions (see Exceptionsin the Personal Backup Script Options) section), but Personal Backup gives you a much faster way to make individual exceptions: simply click the action for that item in the Change To column: you'll see a popup menu, from which you can choose to disable that item from being copied. Once you've confirmed that the backup or synchronization script will go as you like, you can run it by pressing the Play button, or go back to the main window by clicking the Edit Mode button in the window's lower-right corner.